Which Are The Natural Stone Wonders of The World? The ancient world learned the art of masonry with the discovery of natural stones. In fact, the beginning of human civilisation witnessed the construction of influential structures and monuments that were mainly made of natural stones. These began to be known as the wonders of the world. However, some of the earliest stone wonders could not endure through the natural calamities, except the pyramids. But the craze of stones did not see a decline. Even the later generations favoured natural stones for the construction of magnificent structures backed by incredible architecture. These wonders exist even today and are standing evidence of durability and beauty. Today, we use a wide variety of stones to enhance the architecture of modern buildings with applications that were introduced centuries ago. Let us travel through the pages of history to peek into the sources of inspiration! Taj Mahal in India is a reflection of Mughal architectural style emphasising on symmetry and balance. It took 20,000 workers and 16 years to build the white marble icon. Taj Mahal was commissioned by Mughal emperor Shah Jahan who planned to build an identical Taj Mahal with black marble. 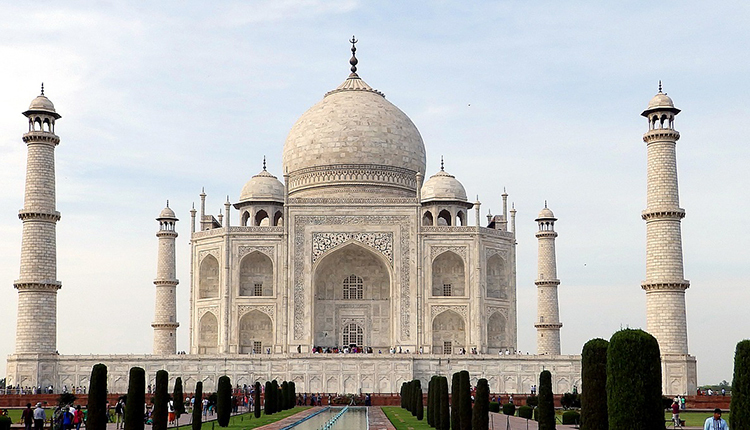 The white marble used in constructing Taj Mahal was brought from Makrana village in Rajasthan (India). Hence, the stone is popularly known as the Makrana Marble. The natural stone is an ultimate example of old and best quality marble. It is ideal for flooring, walls and building decor. Impressively, the marble is not chemically treated so it doesn’t change colour. Shah Jahan encouraged the use of the white marble embedded with semi-precious stones. Gemstones, sandstone, and white crystalline marble were used in building the structure. Victoria Memorial in Kolkata is another example of a structure made of Makrana Marble. The Great Pyramid of Giza or the Pyramid of Khufu is the sole remnant from the Seven Wonders of the ancient world which were built more than 2,000 years ago. It took almost 20 years to build the structure, concluding around 2560 BC. Although, how the pyramid was built is still a mystery, researchers have explored a lot about the stone composition. This Great Pyramid comprises of 2.3 millions blocks of limestone with each stone weighing approximately 2.5 tons. This limestone variety was quarried from Tura (located south-east of Giza), hence is known as Tura limestone. 5.5 million tons of limestone and 8,000 tons of granite was used for the world’s largest construction. The surface of the pyramid was covered with “casing stones” that are known to survive a huge earthquake. Although the outer casing stones were slackened by the quake, the structure did not collapse. The Colosseum in Rome is an oblong amphitheater with arcades and half columns. The structure is one of the best examples of Roman Empire’s architectural innovation. The building was constructed between 72 AD and 80 AD during the reign of Emperor Vespasian. It had space for 50,000 spectators who could enter the building through 80 or more entrances. The Colosseum was principally made of Travertine with other natural stones like limestone, concrete and volcanic stone. Its flooring, walls, upper stairs, pillars and radial walls are all composed of travertine, tuff and limestone. Brown to yellow colour travertine was used in the building which contributes to its yellowish hue. The Colosseum is the best example of travertine used in construction. The Great Wall of China, now a Chinese national symbol is not a single wall but a series of fortifications built over the course of time by different dynasties. 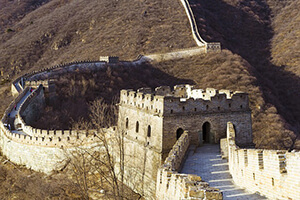 The Great Wall was built over 1800 years running along a length of approximately 20,000 km. The Great Wall is a beautiful example of the strategic use of the local natural terrain. When the builders were constructing over the mountain ranges, the stone of the mountains was used. When on the plains, earth rammed into solid blocks was used while in the desert the branches or reeds and red willows were layered with sand. In the later years, when the brick-making technique came into existence, brick was used. The stone used was carved into rectangular shapes to mainly support the foundation, inner and outer brims and gateways of The Great Wall of China. Machu Picchu was a city located on the eastern slope of the Andes Mountain in Peru. The new wonder of the world is a classic example of Inca style. The Inca civilization chose the dry stone technique to build the structures of the city. The dry stone technique employs stones without using any mortar to bind them together. The dry stone structures are a unique art of construction which is characterised by its stability. The primary material used in the construction of Machu Picchu was heavy granite stone. The stones were perfectly cut and put together like a huge puzzle. Some of the stones were so tightly put together that inserting a knife would also be impossible. The Machu Picchu's stone steps are carved out of a single piece of granite - difficult to cut, even with modern technology. Petra noted as "half-built, half-carved into rock" by UNESCO. It is a city built in Jordan about 2,000 years ago. It is famously known as the rose-red colour stone-carved city because of the red to dark brown sandstone varieties used in the architecture. The Petra comprises about 800 monuments including temples, funerary halls, corridors, arched gateways, tombs, street and baths. Al Khazneh is the most significant structure in Petra carved out of sandstone. Sandstone was used in constructing Petra as it was lightweight and resistant to weather impacts. The beauty of the city enhances tenfold during sunrise and sunset when the natural stone buildings appear multicoloured. How Quality Marble India Can Help You With Your Natural Stone Wonder Projects? With mastery in stonemasonry, Quality Marble India has established its expertise in different parts of the world including Kuwait, London, Karachi, Busan, Doha, Abu Dhabi, Bahrain, Istanbul, and Cairo. We specialise in unique stonecrafts, landscaping elements, installation of outdoor entertainment areas, resorts and exclusive residential space and a lot more. We believe that every space is different and that every structure has a meaning behind its existence. Therefore, we are committed to providing the ultimate bespoke stonework. Some of our exclusively designed projects include The Avenue, Kuwait where we used Indian Flamed Jet Brown Granite embedded with beautiful cobbles for the flooring; Dar-El-Salwas, Official Palace of the King of Kuwait where we have supplied Indian Pink Dholpur Sandstone, Dholpur Beige, Red and Chocolate Sandstone employed in wall cladding, arches, gazebos, domes, corniche, railing, pillars, copings and landscape floor patterns; Hotel Holiday Inn Downtown, Sharq where we have delivered Absolute Black Granite solution for bathrooms, kitchen tops and buffet restaurant and supplied and employed Bottonico Marble for renovation of complete elevator lobby. Our ancient natural stone architectural innovations speak for the beauty and longevity of natural stones and therefore keep inspiring us in our every project. Do you want a glimpse of the stone wonders sparkle in your home or commercial space? We can help you achieve it! Introduction To Inlay Work In Natural Stones Natural Or Artificial Stone - Which One Is Best For Your Space?